MIAMI, Florida -- As of 5 a.m. Eastern Daylight Time on Friday, October 17, 2014, NOAA's National Hurricane Center in Miami, Florida has issued a Public Advisory due to the presence of Hurricane Gonzalo over the western Atlantic Ocean. Gonzalo is located about 240 miles south-southwest of Bermuda and is moving north-northeast at 15 miles per hour. NOAA's National Hurricane Center's storm tracker map forecasts that Gonzalo will continue on a north-northeast path with an increase in speed through Saturday. The Gonzalo's hurricane eye is expected to be near Bermuda by this afternoon or tonight. 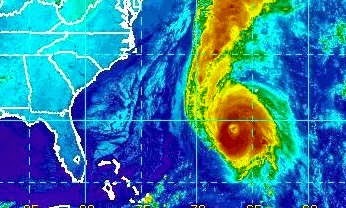 A hurricane warning is in effect for Bermuda. Hurricane Gonzalo is a major Category 4 hurricane on the Saffir-Simpson Hurricane Wind Scale with maximum sustained winds of 130 miles per hour with higher gusts. Gonzalo is the strongest hurricane to form in the Atlantic since 2011. Tropical storm-force winds extend 175 miles from the center of Gonzalo. Spaghetti model forecasts are generally in agreement that Hurricane Gonzalo will remain well off of the U.S. east coast. 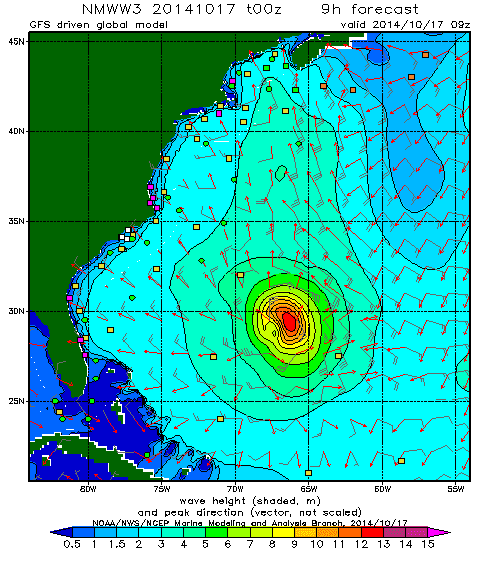 However, large swells generated by Gonzalo have begun to impact the U.S. southeast coast and will impact the rest of the U.S. east coast later today through Sunday which will create life-threatening conditions for both mariners and beach goers. GONZALO WILL BE NEAR BERMUDA THIS AFTERNOON AND TONIGHT. BERMUDA. FASTER WEAKENING IS FORECAST TO BEGIN TONIGHT. THE ESTIMATED MINIMUM CENTRAL PRESSURE IS 946 MB...27.94 INCHES.